Experience the Badehaus in Rödermark. 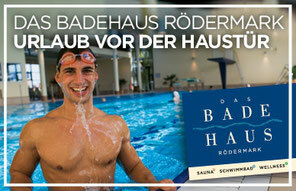 Whether swimming pool, sauna or wellness, the Badehaus is a popular meeting place for young and old. 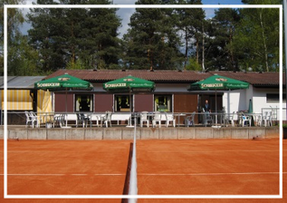 For only 10 € you can play tennis for an hour. The amount is to be paid in advance at the reception. The TCW is easy to reach by car or by bike through the fields of our house in 2 km. More information at the reception. 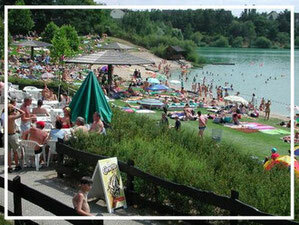 "St. Tropez am Baggersee" already sang the Rodgau monotones over the famous bathing lake in our neighboring community. The bathing lake offers from the naturist area over a sand beach to various sports possibilities variety for a whole holiday or longer. It is easy to reach by car or bike path through the fields of our house in 5km. Do you like cycling and looking for a nice route? Then you are in good hands with us. The beautiful Rödermarker Radrundweg leads directly past our house. With its 21km it is ideal for a round on the bike after the end of the evening or even for a long run? On the trip you will meet the 50th latitude, the Roman route and a group of Celts. The way is very well signposted. 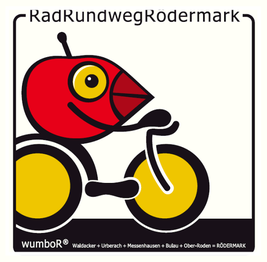 Just follow our Rödermärker wumboR (r) mascot.